Free time in Ramadan is somewhat of a paradox: you have a lot of free time, but, conversely, you don’t have a lot of free time. So the question is, do you have enough time to keep your home clean during Ramadan? Depending on the person you ask, the question may be yes…or no. At mUsta, the answer is always yes! 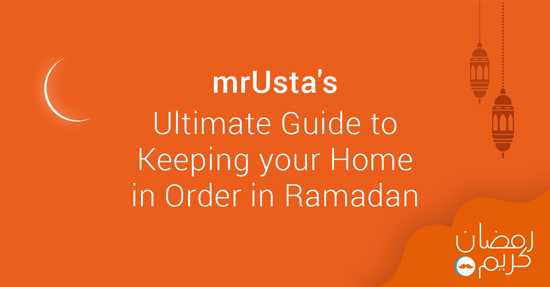 Not only is it essential that you keep your home clean throughout the year, but during Ramadan, there’s a certain spiritual aspect to it. So, during the Holy Month, as in every month of the year, don’t forget to pay attention to the cleanliness of your home. And not only that, take advantage of that extra time (which you may claim not to have) and get your home in organized – a ‘spring cleaning’ of sorts. It’s also a chance to be environmentally responsible and to minimize your eco-footprint. Much of your time in Ramadan will be spent in quiet prayer and reflection, as well as preparing for iftar. So when do you find time to clean? In the early morning of course! Whether you work or not, Ramadan hours in the UAE allow for most of us to start an hour or two later than normal. This is the ideal time to do your housecleaning. If you have children, get your kids involved! It’s a perfect time to teach them about the importance of cleanliness (you know…’cleanliness is next to godliness’). If you do practice Ramadan, your home pretty much becomes your house of prayer. So pay special attention to the things you wouldn’t normally clean, like the walls, decorations, furniture, and so forth. Need help? Then just book your house cleaning service here with us! Man, by nature, is a hoarder. Although there is absolutely no reason for most of us to keep 90% of the stuff we own, it seems some primal instinct tells us to hold on to things ‘just in case’. Well, as Ramadan is, amongst other things, a month of altruism, it may be an opportunity to give some of your items to charity. Donate your unwanted books to a library or charity. Similarly, go through the other times, like jewelry, decorations, and other random items and either give them away or sell them and give the money to charity. Take advantage of the extra time (stop arguing – you HAVE time) to organize storage boxes and file paperwork into folders. Some green advice: dishwashers are more hygienic and save more water and energy to reduce your bills. If you prefer hand washing, don't run the tap: fill a bowl with hot soapy water and rinse dishes according to glass - cutlery - ceramics - then pots, cleanest to dirtiest. Empty out all your cabinets and wipe down shelf space before re-shelving food products according to frequency of use. Label all your containers so you know exactly where everything is. Empty, clean and restock your fridge/freezer and check expiry dates of food. Keep fresh produce (fruit/veg), dairy, and fresh meat on different shelves. Sort out packaging like brown paper bags into a drawer to reuse for travelling and late iftaars. Empty out all those holders, only keeping the essentials. Leave one old toothbrush to clean around taps and tiles. Keep the drainage system unblocked by pouring down one cup each of baking soda and vinegar, then one liter of boiling water. Prevent blockages by cleaning after yourself and placing down a plughole drainer. Wash, dry and fold all your towels. Keep two guest towels in the linen closet. Ramadan can be up to 30 days long. Take advantage of this month and get your home in order. After all, you only get this chance once a year.